"I am the assistant general manager at Quality Inn & Suites in Canton, Ohio. In 2004 we had NATURE STONE installed for our pool deck. We previously had concrete that we would end up having to paint every year. We have never had one problem with the NATURE STONE since it was installed. It has made our pool area a lot more attractive. I recently talked with some guests staying at our hotel who were thinking of putting NATURE STONE in their basement. They frequent several hotels in the Akron and Canton area. They commented that our pool area was the best one and part of it was because of the NATURE STONE. The durability of the NATURE STONE is wonderful. It has not faded, nor chipped any part of it since we had it installed. We cannot say the same for imposter brands. Our sister hotel in Streetsboro had a similar deck installed, but it was obviously not NATURE STONE. The stones are faded and some have chipped away exposing the concrete underneath. I am very glad we had NATURE STONE installed." "We are very pleased with the NATURE STONE flooring that your company installed in our school building. We have had many favorable comments regarding the floor covering. I would highly recommend your company for installation of NATURE STONE. "The new NATURE STONE floor that we recently put in our banquet space is perfect! The new look really finishes the area and all of our brides have been delighted…the servers even say they can feel a difference at the end of a long shift." "As you know our corporate headquarters in Independence was flooded in June of 2006, which required employees to help remove over 6000 sq. ft. of wet, muddy, carpet – we decided never again and began researching alternative flooring solutions for our offices. Although the investment was higher than commercial carpet, we needed to consider the potential for future flooding. The fact that we could simply steam clean NATURE STONE made the economic decision easier. Having lived with NATURE STONE for over a year now – we are convinced we made the right decision! NATURE STONE is terrific on the maintenance side and it continues to make our offices look great and we constantly receive compliments from visitors. 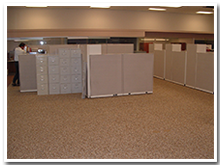 Another benefit of NATURE STONE is that it has decreased the acoustic noise in our offices to a much greater extent than carpeting. I heartily endorse NATURE STONE as a flooring surface in commercial applications!" Lisa Kurtz - Kurtz Bros, Inc.
"I had my garage floor installed by your company. My garage floor was a mess. It was cracked, pitted in spots, stained with oil and salt; for the most part, embarrassing to walk through since everyone enters our home through the garage. From the salesman, Chuck, who sold us our floor and explained their unconditional warranty and array of color choices to the installers, I've never been more satisfied dealing with a sales person. My wife and I will never forget when he said; 'I’m going to do everything in my power to make sure you are happy with your new Nature Store floor.' And they did everything he said they would do. Now when our friends and family enter our home through the garage, we are so proud of the way our Nature Stone garage floor looks. Thank you for a job well done."